The red shirts gathered at Ratchaprasong around 1pm, crowds growing to around 5,000 to 7,000 by 2:30 when they departed for Democracy Monument. 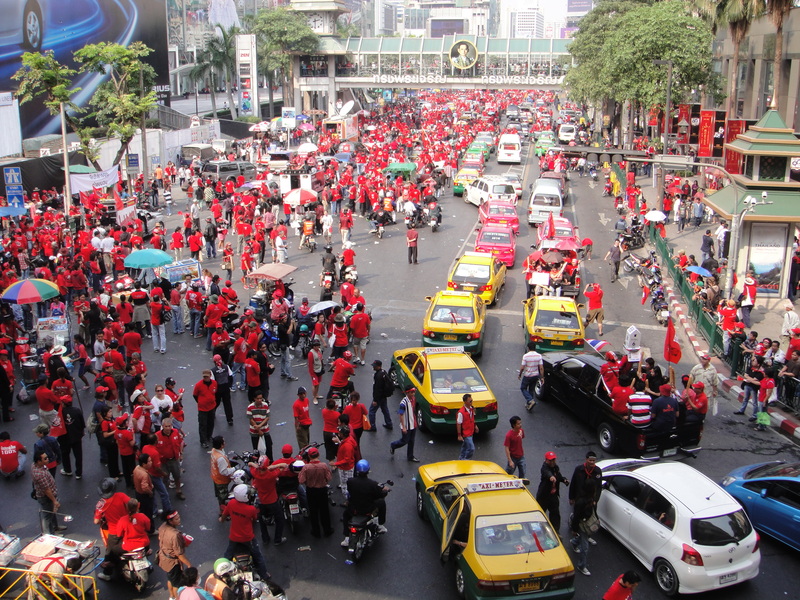 The red shirts were making the trip in a procession, the crowd at the Democracy Monument was reported to be much larger. The protest was peaceful, a party type atmosphere with much music and horn honking. The primary goal is to maintain awareness about the red shirts and their agenda. In what seems to be a major change after meeting with the shop owners and vendors around Ratchaprasong, the red shirts will only gather there once a month. Ratchaprasong is the intersection at Central World, in the heart of the Bangkok shopping district and very near the Siam shopping mall. Certainly the red shirts are trying to gain support and understand blocking a central shopping area on a regular basis will not increase endear them to many locals and business owners. The next red shirt gather will be 13 February, it sounds as if the next gathering will be a much larger turnout. This entry was posted in Bangkok, Culture, Politics, Thailand and tagged Bangkok, Bangkok protest, current events, Farang, is bangkok safe, Red Shirt March, Red Shirt Protest, red shirts, Red Shirts in Bangkok, Red Shirts Protest, thai politics, Thailand Politics, travel to Bangkok now. Bookmark the permalink. Yes. I feel Bangkok is safe but would suggest avoiding the protest sites.